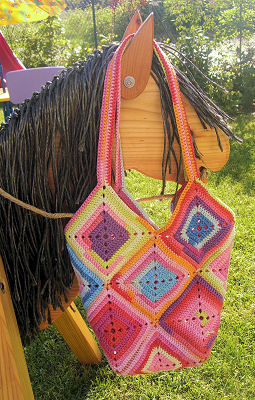 I am dying to make this bag! Once you have your 16 squares crocheted, it is constructed in an interesting manner. The pattern, in PDF, is here. The designer is German, and I'd like to give her a shout-out for making such a pretty thing available for free. I need a solid red one! This page contains a single entry by MamaT published on August 18, 2009 8:50 AM. LaMa's Musica Lunes was the previous entry in this blog. Pretty Bag Pattern Tuesday! is the next entry in this blog.